Since I wrote The Haunter in the Dark, my appreciation of Lovecraft’s stories has changed considerably. I find myself unable to simply read one of these tales; I have to take a mental scalpel to them to slice them into gameable slivers and chunks. I still enjoy the stories; I actually feel like I’m getting more enjoyment out of reading each one because of the extra layer of activity. 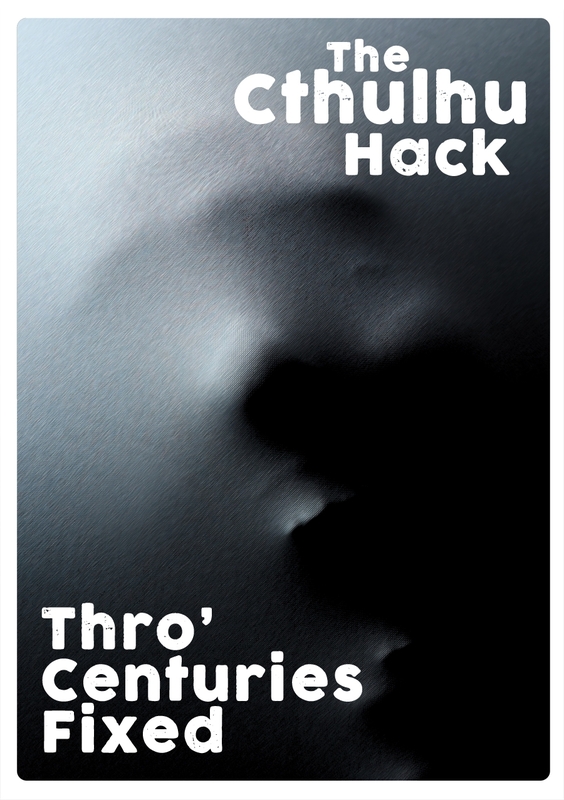 As The Cthulhu Hack: The Haunter of the Dark suggests, I find I now read each story a couple of times and come away the second time with a wealth of ideas, potential gameable material and a lot of questions. When I prepared Thro’ Centuries Fixed for publication, I presented it in a format with a wide margin on one side. While I’m not 100% committed at the moment to the idea of this being a physical print product, I am 100% certain it isn’t quite finished yet. I have the need to fill that margin with notes. I’m re-reading the source story for the third time. I have thoughts. I’m certain to find facets that warrant dwelling on, extrapolating from, and expanding along new lines. While this modern adventure has one-shot written all over it on first read-through, I think it also has the potential to kick off a campaign. The weird thing about the campaign angle for me is that this could be a campaign with the characters – or it could be a campaign that follows on from the premise and purposes established, but using other characters. 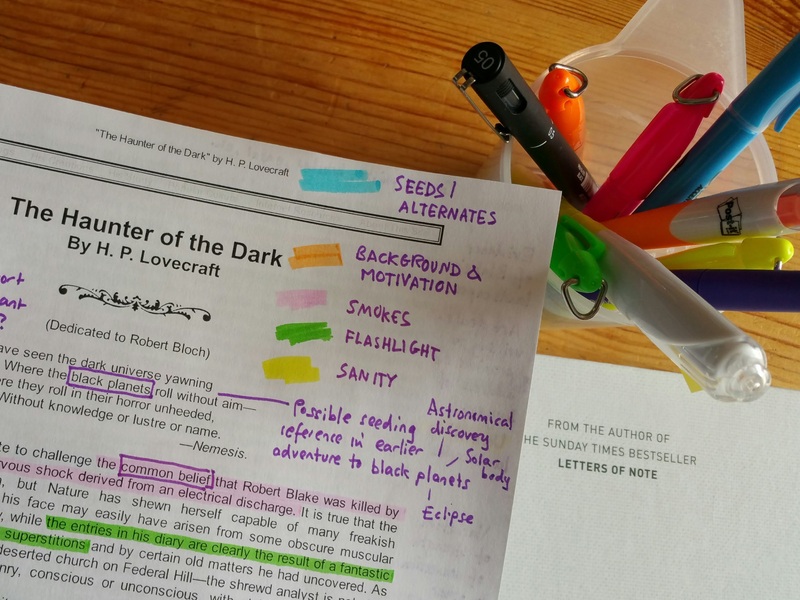 As I explain in Haunter, you should always keep notes when you’re reading or have a highlighter handy. I have two copies of this adventure printed out and plan to have it looking like my copy of Lovecraft’s The Haunter of the Dark in no time at all. I try to scatter pens around the house specifically to facilitate and accommodate my need to annotate – else I fear I’m going to forget something before I have time to take note. I think it might be too fresh to start citing ideas here – because I wouldn’t want to spoil it for anyone playing it. Instead, the campaign ideas and possible cross-reading / viewing will get themselves a place in those margin notes I haven’t finished writing yet. Now you know. When you print it out at home and wonder why I’ve left all that white space, you can be assured that it won’t all remain open and airy forever. I have marginalia incoming. And, for that matter, by leaving those wide margins I’m empowering you to fill them. UPDATE: The current version of Thro’ Centuries Fixed includes extensive new margin notes, a map of the adventure site, and tweaks to the text.